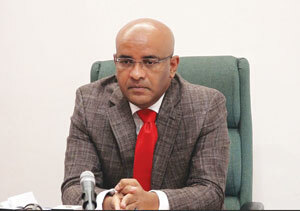 Opposition Leader, Bharrat Jagdeo is blaming the incompetence of Public Security Minister, Khemraj Ramjattan, for the recent unrest at the Lusignan Prison, which saw the escape of three prisoners, and a number of inmates being shot with pellets, among other signs of disturbance. The Opposition Leader said that almost every year under the coalition administration, there is some huge issue as it relates to security. “And they used to say we are weak on law and order, and almost three years you had some burning of the prison and loss of life etc., because of the incompetence…they created this moral hazard by their own acts,” Jagdeo said. He is of the firm view that for years to come, the country will continue to suffer as a result of this. He said that this is especially as it relates to the housing of prisoners. The statement also mentioned that the Guyana Police Force was putting all measures in place to locate and apprehend the escaped prisoners. Director Samuels subsequently held a press conference to address all related issues, at his Lot 46 Brickdam, Stabroek, Georgetown office, where he informed media operatives that the aforementioned prisoners had escaped from holding bay #1 at the Lusignan Prison. Samuels said the facility was secured at the outer perimeters by four watch towers that were manned by police and prison ranks, who have a bird’s eye view of the facility that gave them the advantage of seeing into the prisons, which should have allowed them to witness the escape. Samuels gave the assurance that several search parties were deployed to effect the recapturing of the escapees. And hours after the press conference, Kaieteur News received calls from the family members of prisoners, stating that there was a riot at the Lusignan Prison. When this publication arrived on the scene, there were already two fire tenders and a number of high-ranking police and prison officials present around the facility. Intermittently, gunfire could be heard, and prisoners could also be heard shouting. Sometime around 19:00 hours smoke started to come from within the prisons and firemen rushed to put out the blaze that erupted as a result of prisoners lighting mattresses. Fire fighters had to be dodging missiles from within the prison that were being hurled by prisoners in an attempt to ward off their attempts to quell the fire. A prison officer then fired some warning shots that saw the prisoners backing down for a short period of time. Within this time, a police vehicle left the prison with a number of injured and wounded inmates. The recent fiasco at Lusignan follows the July 2017 escape of a number of prisoners from the Camp Street, and later, the Lusignan facility, two of whom, Paul Goriah and Cobena Stephens, are still on the run. All of this happened after the Camp Street Prisons were razed when prisoners started rioting under similar circumstances. This saw 17 inmates dying because of burns, smoke inhalation and injuries received during the unrest.